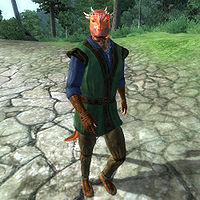 Wumeek is an Argonian commoner living in the Imperial City's Elven Gardens District. As the incorrigible gambler he is, Wumeek divides his time between the Arena and hanging around with his two friends, Dul gro-Shug and Geem Jasaiin. On Morndas, Middas and Fridas, he will get out of bed early at 6am and wander impatiently around his house, waiting for the Arena to open up. He leaves in good time at 8am and makes it just in time for the Arena's opening time at 9am. Once there, he will spend a whopping thirteen hours betting on his favorites, The Blue Team. When the Arena finally closes down at 9pm, he heads for his favorite bar, The King and Queen Tavern, to meet up with his two friends as well as the other regulars. He heads back to his house at 11pm and goes to bed at midnight. On Tirdas, Turdas and Sundas, he skips gambling altogether and will, after waking up at 6am, stay inside his house and host a friendly visit from Geem between 11am and 4pm. When Geem leaves, Wumeek stays at home for an hour before heading for the King and Queen at 5pm for an hour of socializing. He heads home for a two hour dinner at 6pm and enters the tavern yet again at 8pm. When the clock strikes 11pm, he staggers back to his house and jumps into bed at midnight. On Loredas, he will change his plans once again and spend his morning relaxing in the house. At midday, he leaves for an afternoon stroll around the Green Emperor Way, before returning home at 6pm for dinner. At 8pm, he pays his usual visit to the tavern until 11pm when he heads home and spends an hour on the ground floor, before finally going to bed at midnight. On the 19th of each month, he gets out of bed at 5am and starts his long journey towards Leyawiin. He crosses the Talos Bridge, turns south on the Red Ring Road, and takes the Green Road all the way to his destination. After 25 hours of traveling, he will book himself in at the Five Claws Lodge. After that, he is supposed to pay a visit to Weebam-Na but doesn't due to a bug. As a result, he hardly gets any time in Leyawiin before heading back home to his usual routines. He dresses up in typical middle-class clothing: a blue & green outfit and russet felt shoes. He also carries around a pair of light brown linens, his house key and a leveled amount of gold. When you approach him for the first time he will politely introduce himself: "I am Wumeek. Gods commend you." When you ask about the Imperial City, he will tell you that, "Argonians stick mostly to the river trade. We know boats and the water. We're not fussy about the sewers, either. Water cleans it all." If you run into him at the Arena, he will not hesitate to describe his favorite team: "Go Blue Team! Yeah, Blue Team! I always bet on the Blue Team! They never hold back! It's always crush, kill, maim, murder! Ha ha ha ha ha!" Wumeek is supposed to visit Weebam-Na when he is in Leyawiin, but he does not. The reason for this seems to connect with Weebam-Na's involvement with the Nocturnal quest. A failsafe was implemented by the developers to make sure that Wumeek will not interrupt the quest, but the failsafe works too well, as it prevents Wumeek from visiting Weebam-Na at all times. Instead, Wumeek travels back right after arriving in Leyawiin.